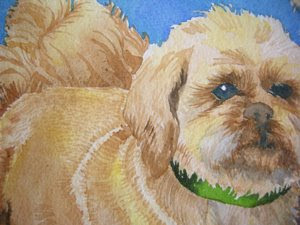 Small, wet strokes of color create the illusion of fur. Use a light touch. Use primarily the same color over all the areas at this stage of painting Riley's body. This uniform color will give unity to his body. Again, the close up view doesn't look that great, but when you pull back, look at in a mirror, or from across the room, it is amazing how the eye pulls it all together. When you allow the viewer's eye to do some of the work, the piece will have the impression of more life to it than if you paint in every hair and leave nothing for the viewer to enjoy or ponder. I teach classes in the Melbourne, Florida area. If you are interested in drawing or watercolor classes you can learn more by visiting my website - click here.